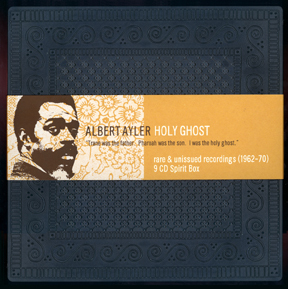 The concept for this project was to create a 'Spirit Box' filled with keepsakes from the life of Albert Ayler. The idea being that we would be looking into a private collection or scrapbook, maybe Albert's or of someone who knew him well and had kept things from his career. 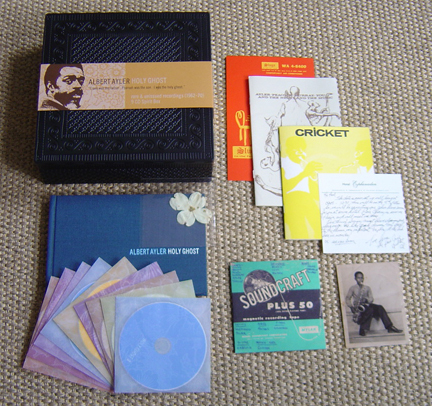 These keepsakes include a 208 page hard-cover book about his life with texts, notes, photographs, and a list of all the places he performed, 9 cds in multi-colored vellum sleeves, a bonus disc of Ayler's 1959 combo while he was stationed with the U.S. Army in France, a photograph of Albert at age 12, a reprint of Amiri Baraka's 'black music in revolution' magazine "Cricket", a couple of flyers from Albert's hey-day, and, most famously, a real dried dogwood flower. Personal Notes: Noel Waggener and Dean Blackwood were the all-mighty directors of this project... I functioned as the production designer, and managed the faithful re-production of a myriad of assorted materials. I designed the hardcover book with the help of Noel and the entire Team Ghost. Once again I had a wealth of material to choose from. I had excellent support from Cynthia Sesso at CTS Images, who researched and found the best of what the great jazz photographers of the era had to offer. Albert was so dynamic with his flashy suits and spotted beard. I believe he really inspired the photographers who were documenting his art. The set was really a team effort. The writers, Ben Young, Tom "Kid Millions" Greenwood, and Carlos Kase were great guys to work with. Before this project I really knew nothing about jazz music, and even less about free jazz, so it was a great learning experience for me.